Dougherty Street along the Assembly area will be closed to traffic at 4:45 p.m. 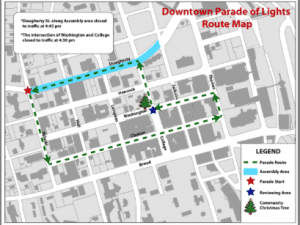 The intersection of Washington Street and College Road will be closed to traffic at 4:30 p.m.
Take a look at the route of the parade and see where these streets are in relation to it. Click the map to see a zoomed in version.